The WSSH300 has a good number of features that not only make laundry cleaning more efficient but also take away much of the trouble in doing this chore. 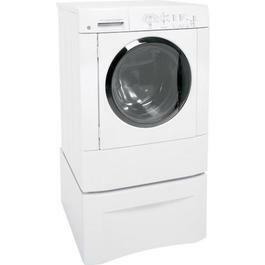 First off, this front loader is an energy-efficient home appliance that is Energy Star compliant. With no agitator, it reduces the amount of water used. In turn, less energy is also needed to push through with the cleaning process. This means that consumers can save on water and electricity cost as well as qualify for rebates, if available in their locality. This front loader can accommodate larger loads and heavy laundry items because of its volume capacity of 3.5 cu. ft. This is ideal for households that do large batches of laundry or have to wash the drapes and bedding on a weekly basis. Fortunately, the the WSSH300 has up to 10 wash presets: spin, rinse, soak, heavy, regular, perma press, quck wash, active wear, delicate and handwash. All these can be used for a customized washing option that fits the type of laundry loaded into the washer. For instance, the quick wash feature is especially helpful for those who have little time to do their laundry or has to do the cleaning in less time so they can wear or use the clean clothes in an instant. The wash presets enable the washer to perform thorough cleaning without ruining the strands and hems of the fabric. The delicates setting would be ideal for articles of clothing with thin or flimsy fabric pieces such as night gowns and swimsuits. The soaking option helps drive away stain and dirt as it lets the detergent work its way through the fabric. The hand wash option is also best used for laundry items that require gentle but meticulous washing. The rinse option also makes sure that the laundry items are free from any detergent residue. The WSSH300 operates at a maximum speed of 950 rpm and features up to four spin speeds. Like other front loaders, it has an automatic water level and comes with four temperature options: cold/cold, warm/cold, warm/warm, or hot/cold. Other convenient settings are available through its dial controls. The end-of-cycle signal, for instance, can easily alert users of the progress of the spin or cycle. Users can also delay the wash up to 8 hours through its delayed star timer. These are just among the intuitive features of this washer. The fabric conditioner, bleach, and detergent dispensers also ensure the even distribution of these laundry products. Regulating their use would translate to bigger savings and result in lesser risk of damaging the fabric pieces with discoloration and odor. Despite its numerous options, this washer still manages to operate quietly. It is free from annoying squeaks and hums and can do its job well while leaving users more at peace. This front-loading washer offers all the basic features found in most modern washing machines that are out in the market. One of the advantages of having this washing machine is that consumers can save some on money because of its energy-saving feature. It also doesn't require too much water, so users can expect cheaper utility bills. Because of the large capacity of this washer, users can throw in big comforters and blankets for cleaning. Some of them have also cited less loading times as among its foremost benefits. It cleans well and leaves no odor. Many consumers particular like the fresh and sanitized feel on their clothes. For some consumers, WSSH300 failed to meet the requirements of a quality laundry appliance. One of the drawbacks of this washer is its large size. It takes up more space and cannot be fitted easily into available spaces. Some consumers also recommended other models and brands that work better and has more features. Like any other washer, the WSSH300 has its own share of advantages and disadvantages. When it comes to design, this washer is not as competitive as it is when it comes to performance. Still, it does a good job at laundry cleaning, even with different types of clothing. The key to having a thorough wash is to use the right wash settings. I have had this washer for @7 years and so far it has performed as a washing machine should. There is the issue with front gasket mold, but it's not a deal breaker and it's something all front load washers suffer from. Overall I would buy it again. This is the biggest piece of crap I have ever owned. From the day I got it delivered 5 years ago I have had nothing but trouble w/ it. 1) won't stop filling w/ water. 5) the OPTIONS ( extra rinse, extra spin etc. ) only work when thet want to. I will NEVER buy GE brand anything ever again.